This was the dramatic scene as the world's largest statue of Jesus was hit by lightning. 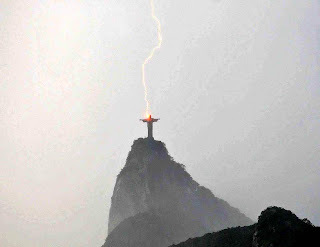 The bolt parted the thunderclouds over Rio de Janeiro, Brazil, to strike Christ the Redeemer. The statue is 130ft tall, is made of 700 tons of reinforced concrete and stands atop the 2,296ft Corcovado mountain overlooking the city. It was named one of the new Seven Wonders of the World in 2007. Sunday's storm caused havoc in Rio, felling trees in several neighbourhoods - but did not damage the statue. This amazing photograph gives whole new meaning to the phrase "May God strike me with lightning if..."